My favorite website to get reliable surf data is, without question, Surfline.com. Surfline started as a pay-per-call service in Huntington Beach in 1985. Callers would phone in and listen to a daily recording of swell size, wind direction, and surf conditions. 33 years later, Surfline has transformed into the ultimate surf forecasting website and even hosts 100s (if not 1000s) of live HD surf cams around the world. Want to see what the waves are doing in Pipeline, Hawaii right now? Simply click here to virtually navigate to one of the best (if not the best) wave in the world. Surfline also utilizes our personal webcam located on the Penthouse roof deck if you find yourself daydreaming of your favorite Central American beach. When I first enter the Surfline homepage, I click on the global swell map to get an idea of what each ocean basin is doing. Since I live in Costa Rica, I am looking in both the North and South Pacific for any major storms that could be potential swell creators. Looking at this map won’t help you with your session tomorrow, but it will give you an overall idea for the next few weeks. This particular map below shows a strong Southern Hemisphere storm which is a good sign for prolonged swell generation for Costa Rica in the near future. After geeking out a bit with this map, I click on the Lola Classic option located under the Forecasting tab. After navigating to Costa Rica, I am presented with a line graph that shows the upcoming individual swell events for the next 6 days. Each individual swell is represented by a different colored line. We are also given 2 other distinguishing numbers in the chart below: the swell angle and the swell period. Need a quick refresher on these topics? Click on my previous articles, The Importance of Swell Period and The Importance of Swell Angle. 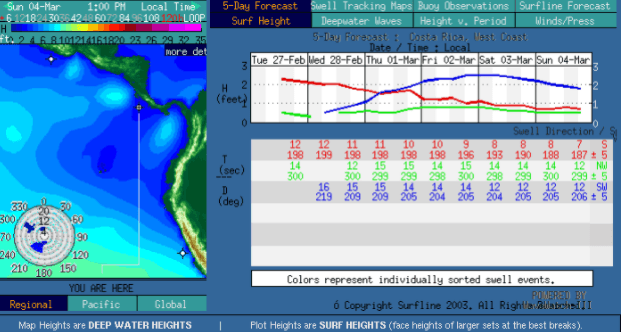 Let’s look at Thursday, March 1st for a quick example and break it down swell by swell. The red line represents a dropping swell in the 2 foot range with a dominant period of 11 seconds and an angle of 198°. This is an old swell that peaked several days ago, but there is still some residual, “bottom of the barrel” energy filtering in. If you are not sure what the angle represents, take a look at the compass on the left hand side and you can better imagine where the swell is actually coming from. Since swells originate from massive storms in different parts of the oceanic basin, the corresponding swell angle will reflect the original location of the storm. Looking at the blue line, we can see a new, building swell in the 2 foot range with a dominant period of 15 seconds and a swell angle of about 209°. Keep in mind, a new swell will always start with high seconds and then decrease as the swell event progresses. Even though both the red swell and the blue swell are in the 2 foot range, the blue swell with 15 seconds holds much more energy, and the waves will actually grow higher as they reach shallow water. This phenomena is called shoaling. Finally, we have a third swell represented by a green line which is a small background swell in the 0.5 foot range with a dominant period of 15 seconds and an angle of 299°. Because of the swell angle, we can tell that this was a weak swell that originated in the North Pacific as opposed to the 2 other swells that originated in the South Pacific. Even though this swell is quite minimal, it should add just enough energy to offer more consistency and shape to the 2 other dominant swells. 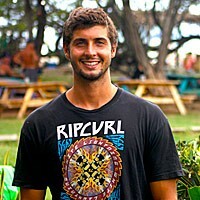 Overall, Thursday, March 1st if looking like an excellent day to surf with a triple combo swell. 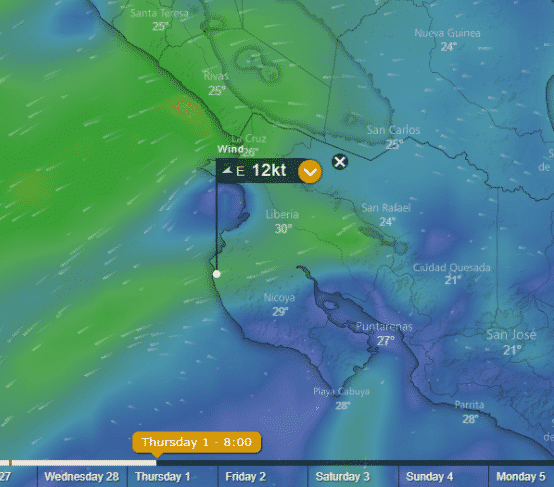 For a more coherent weekly forecast with professional analysis, you can also navigate to the North Costa Rica Forecast page. This page provides a sort-of weekly outlook for swell size and conditions. The information is fairly straightforward here and more user friendly if you are having trouble analyzing the swell chart provided by Lola Classic. The final (and most important) element we must check is the wind. The wind on any given day is the X-factor for a surf session. Even if the swell is phenomenal, hard onshore winds can wreak havoc on the wave quality. Luckily in Northwest Costa Rica, we benefit from the Papagayo winds from November – April offering us lots of offshore winds offering perfect surf conditions all day. Want to learn why we benefit from these winds? Check out my previous blog on the Papagayo Winds. My absolute favorite website to check the wind is windy.com. With a Google Earth looking layout, it has never been easier (or more psychedelic) to check the winds. In the map above, we are looking at Thursday, March 1st. We are zoomed in on the Nicoya Peninsula of Costa Rica with the wind marker on Tamarindo. As the data shows, we can expect light – moderate offshore winds on Thursday morning at 8:00 am until about 11:00 am when it is forecasted to go onshore. Low tide on Thursday is at 8:07 am so if you wanted to score, make sure to pick a low – mid tide surf spot that responds well to the triple combo swell. My final piece of advice to improve your Skunk vs Score ratio is to know your surf spots. Even when all the elements seem to be lining up for an epic day, you must have the local knowledge to choose the best surf spot. Luckily, here in Tamarindo, there is a variety surf spots within a short drive that pick up different swell angles, work on different tides, and even work when the wind goes onshore.